Last Wednesday, cars loaded with camping supplies and jubilant visitors crawled into town for the Telluride Bluegrass Festival. People were already setting up collapsible chairs and sleeping bags along the River Trail for the tarp run the following morning. Yet, I just wanted to take my Stumpjumper out for a ride. Most of the best mountain bike trails near town were closed due to snow cover, and the ones that weren’t were packed with hikers and other bikers. Luckily, I had another option: Norwood, a small town just a 45-minute drive away. I have to admit that I don’t often leave Telluride to go mountain biking; I can ride right to my favorite trails from my house. Similarly, I’ve hardly skied anywhere other than Telluride. What’s the point? But heck, sometimes it’s worth it to explore the surrounding region. As I drove up Norwood Hill, I thought of the other times that I’d been to this cow town where rent is a fraction as that in Telluride and ranching, not tourism, is the main industry. When I was young, my father and I used bacon-wrapped fishhooks to catch crawdads at Miramonte Reservoir. Later, we’d feed the crawdads to the otters at the old Rocky Mountain Ark Wildlife Rehabilitation Center. We also used to watch the cowboys and go on the carnival rides at the annual San Miguel Basin Fair. My mountain biking excursion would be a different sort of outdoor recreation. When I got to the Thunder Trails Trailhead, just three miles south of Norwood, there were only two horse trailers in the parking lot. 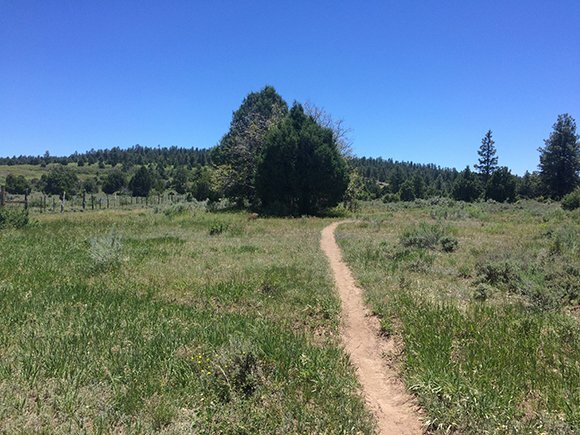 This trail system, completed two years ago, includes four interconnected loops that are accessible to mountain bikers, hikers, horseback riders, and dirt bikers. Hopping on my Stumpjumper, I soon passed the horseback riders and found the solitude that I was looking for. The trail weaved between ponderosa pines and open meadows of light green shrubbery. The single-track dipped and rose, hilly but not mountainous, fluctuating between slightly technical patches of rocks and flowing, dusty segments. Early into the ride, I had to jump over an overflowing irrigation ditch. At each juncture, I stayed left in order to make a full 19-mile loop. The landscape that I encountered was unlike that of Telluride. Here, the beauty is not in the jagged alpine peaks and clusters of purple Colorado Columbines; here, I noticed beauty in the single sunflower amidst a sea of desert scrub, in the vista of the distant snow-capped Lone Cone mountain, and in the ponderosa pine that cascaded over the edge of Naturita Canyon. I only passed two other mountain bikers during the rest of the afternoon. By the time I was three-quarters of the way through my ride, I’d polished off my entire Camelbak. The Colorado sun beat down upon my shoulders, and my mouth got so dry that I couldn’t swallow, but I made it back to the trailhead. On the return to Telluride, I stopped at Clark’s Market and bought a jug of sweet tea that I chugged on the drive back down Norwood Hill. 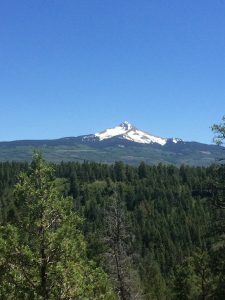 It was the perfect escape, and the trails are open not just during the summer but also during the shoulder seasons, when it can be too snowy or too cold to ride in Telluride. I highly recommend these new trails—they’re worth the drive.